Artificial Solutions® is the leading specialist in enterprise-strength Conversational AI, a form of Artificial Intelligence that allows people to communicate with applications, websites and devices in everyday, humanlike natural language via voice, text, touch or gesture input. Designed for the global enterprise, the company’s advanced conversational AI platform, Teneo®, allows business users and developers to collaborate on creating sophisticated, highly intelligent applications that run across 35 languages, multiple platforms and channels in record time. The ability to analyze and make use of the enormous quantities of conversational data is fully integrated within Teneo, delivering unprecedented levels of insight that reveal what customers are truly thinking. Artificial Solutions’ conversational AI technology makes it easy to implement a wide range of natural language applications such as virtual assistants, chatbots, speech-based conversational UIs for smart devices and more. It is already used daily by millions of people across hundreds of private and public sector deployments worldwide. Many bots fail to deliver enterprise ready conversational solutions and fall short of understanding inquiries. That's where our Conversational AI Platform Teneo is different. Teneo is one of the most human-like experiences available in commercial conversational AI today, providing the complex capabilities required to create the simple, intuitive experience that your customer demands, while increasing customer engagement. 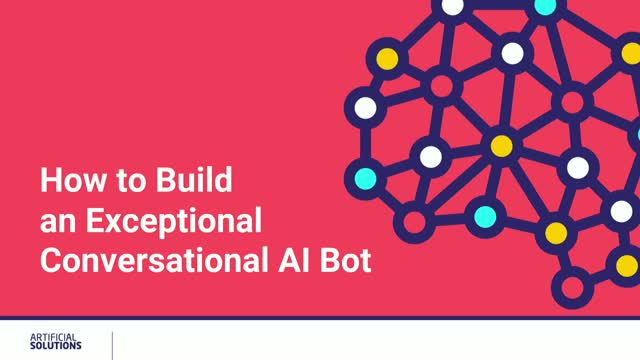 With Teneo, a chatbot can be trained to go beyond the typical 85% understanding mark of competitor products to deliver near perfect results every time. Join Peter Joles, Presales Consultant at Artificial Solutions as he demos a Teneo built financial bot called "MyBank". See in real-time how Peter adds flows to enhance the chatbots' capabilities. Introducing Teneo Developers, a new comprehensive resource to allow enterprise developers and partners fast access to experience the power of Teneo. Visit www.teneo.ai to get started for free.